Prepositions are words that together with grammatical cases of nouns, pronouns,and numerals help to express relationships between different words: сидеть за столом - sit at a table, прилететь в Анапу - to arrive to Anapa city, подъехать к офису - to stop by the office. Prepositions are not independent parts of speech, rather they belong to the words they're used in the sentence. Most prepositions are typical of certain cases: Я буду скучать по тебе (I'll be missing you) - Dative case, Я пошёл с ним (I went with him) - Instrumental case etc. Declension (in Russian Склоне́ние) — is the change of endings of Russian nouns, pronouns and adjectives. 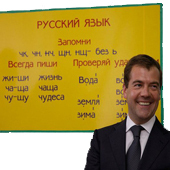 All Russian nouns belong to one of the 3 declension types there are. If you compare English nouns to Russian nouns, English nouns decline only to distinguish singular from plural forms (a ride vs. two rides). In Russian language declension changes endings of words based on cases and number. The case is a category of nouns reflecting connections of the noun to other objects,actions, and attributes.